Plenty of Managed Service Providers (MSPs) claim they have their own specialties within the field of IT Services. That is why business owners should be aware of the different services they offer within the Managed Service Provider realm. If you are considering outsourcing your IT maintenance tasks, it is good to consider the reasons listed in this article before deciding. 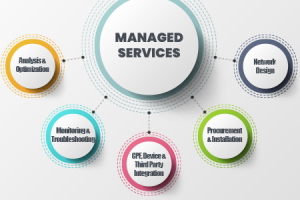 Managed IT Services is a booming industry in the field of IT maintenance. The increase in companies outsourcing their IT support is driving rapid growth in this market. Managed Service Providers can accomplish plenty of tasks agreed upon with their client. For example, as per a recent study 82% of U.S. employers believe smart technologies allow recruiters to focus on more interpersonal and knowledge-based work. Aside from the conventional Human Resources interaction, that is a huge number of employers who are now open to innovation. Every business follows specific regulations to meet and maintain the quality of their products and services. We will give our best effort to understand the laws and regulations that affect your business. We have experience in regulated industries. From daily compliance through audit prep we can assist you with the smooth operation of your business. Downtime does not just affect your current operations but also your opportunity to generate additional sales. You don’t have time to deal with, well, being down! With thinkIT Solutions, you will gain more uptime and improved performance. Save your quality time to focus on your employees and clients, not IT headaches. thinkIT Solutions provides efficient virus protection, spam management, password resets, and round-the-clock monitoring of your network. Your business is our top priority. We have partnered with reliable, efficient vendors to offer the optimal security you wish to have for your business. This guarantees the best chance to prevent IT problems that could lead to worse situations. ThinkIT Solutions understands that businesses want to test out potential MSPs on your short list. We can provide you with different pricing models and options according to your requests and budgetary needs. We know how to be flexible and offer project-based contracts or long-term and efficient SLAs that will work best for your current company. Discuss your budget with us and we will offer you a pricing model that fits your company as it operates today, with room to grow. Are you having doubts about entrusting your endpoint system? And do you think that something might be messed up there? We would love to see your current IT infrastructure. Allow us to examine your setup to know what we can do for your business. If your business needs more equipment or software upgrades, we can definitely guide you in the journey of achieving a better IT operating environment. Business owners should prioritize their IT Security because cybercriminals are getting ever smarter. In 2017, 77 percent of attacks that successfully compromised organizations utilized fileless techniques. This is a big threat to every single business out there. Cybercriminals can steal your capital whenever they get past your IT protection. Staying competitive and turning a profit relies on having the right technology and support to not become the next victim of cybercrime. Just because you’re a growing business doesn’t mean you can’t leverage enterprise-level IT solutions. Partner with thinkIT Solutions to fill your IT gaps or manage all your tech needs. We’ll assess, design, implement and manage your technology on-premise or off-site. Count on our team to help you save time and money while gaining innovative and affordable IT solutions. Contact us now and hear our great offers! Experience what an optimized IT environment can do for your business today!